ABU DHABI, United Arab Emirates—The United States has determined that Iran's planned launch of satellites into space is actually a cover for the regime's continued testing of advanced missile technology capable of carrying a nuclear warhead, Secretary of State Mike Pompeo told the Washington Free Beacon on Saturday ahead of private meetings with Gulf State officials regarding Tehran's ongoing support for terror groups. Iranian officials, the United States estimates, are gearing up to launch multiple satellites into space in the coming days, stoking concern the Islamic Republic is using these space launches as a ruse to test intercontinental ballistic missile technology (ICBM), according to Pompeo, who held a small briefing with reporters in Abu Dhabi. The test-firing of ICBM technology violates United Nations statutes barring such activity, according to Pompeo, who described Iran's actions as provocative and said the Trump administration will rally nations to hold Iran accountable for this nuclear-related work. "You'll see in a handful of days the Iranians intend to launch a space launch vehicle," Pompeo said in response to questions from the Free Beacon. "The claim is that it is to put some satellites in the air. The truth is this will be another step in their understanding of how it is you can launch an ICBM." "The whole world needs to come together to oppose that," Pompeo said, confirming that administration's view that this type of test violates U.N. Security Council Resolution 2231, which calls upon Iran to stop its ongoing tests of various types of advanced ballistic missiles. Pompeo, in the UAE during the second leg of a weeklong trek across the region, signaled that the Trump administration is relying on Middle Eastern nations to join the United States in stymieing Iran's intervention across the region, including in Syria, Yemen, and elsewhere. Pompeo will also travel to Qatar, an Iranian ally that also enjoys American military support. Qatar's alignment with Tehran has been a source of consternation in Washington, D.C., and it appears Pompeo will be seeking to disrupt that alliance during his high-level meetings here. Asked by the Free Beacon how the Trump administration plans to make good on its promise to expel "every Iranian boot" from Syria amid its withdrawal of American forces, Pompeo acknowledged the tough reality of this goal. "Every Iranian boot is an ambitious objective, but it's ours," he said, conveying a clear-eyed view of the situation placed before him. "It's our mission. The tools we will use are broad. The fact that a couple thousand uniformed personnel in Syria will be withdrawing is a tactical change. It doesn't materially alter our capacity to be able to perform military actions that we need to perform." American forces are not wholly vacating the region, Pompeo said, and the anti-Iran coalition the United States leads is fully capable of sustaining military operations aimed at exorcizing Iranian forces from Syria. "But more broadly than that," he continued, "the campaign to create a better world, to allow the Iranian people to have opportunity and democracy has lots of pieces to it: Economic, financial, diplomatic for sure." To that end, the United States announced on Friday that it will hold a ministerial in Warsaw, Poland, on Feb. 12 to galvanize countries across the globe to confront Iran. Leaders from nearly every continent, including Asia, the Western hemisphere, the Middle East, and Africa will attend the summit, Pompeo said. "The coalition is big and growing and the tools that we get from having that coalition all working together on that mission gives us an opportunity to create that chance for the Iranian people," he said. However, the United States has no appetite for going at it alone, Pompeo said, echoing a critical point emphasized in his major address in Cairo, Egypt, earlier this week. "We're happy to be an important part of" the coalition, Pompeo told the Free Beacon. "It's an important part of President Trump's agenda. The nuclear proliferation risks from Iran are incredibly real." "Our mission set is certainly to stop the terror regime, stop the funding of Hezbollah and Shia militias, and funding the Houthis in Yemen, but it has a nuclear component," as well, he said. The central message on this trip remains: "The United States is in fact a force for good. We want to be their partners, we want to work alongside of them to achieve ends in their country's best interests, as well as the United States." Pompeo also addressed criticism by former Obama administration officials about his speech in Cairo, which described the Obama administration as a chief enabler of Iran and ISIS. "I wasn't critical of any of those individuals. It was the ideas that underlay the previous administration's policies. 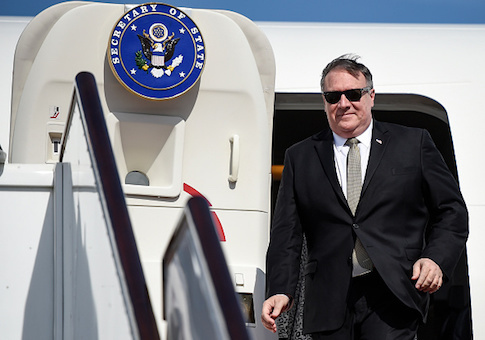 It was their diagnosis of the problem that was all ‘honked out'," he said, invoking "a word from Kansas," Pompeo's home state. "If you diagnose the problem incorrectly you get ISIS. If you diagnose the problem incorrectly you get the Islamic Republic of Iran on the march" across the region, Pompeo said. Addressing the ongoing government shutdown and its potential impact of the morale of Foreign Service employees, Pompeo assured reporters that "morale is good." "They understand that there are squabbles in Washington, but their mission remains," he said.